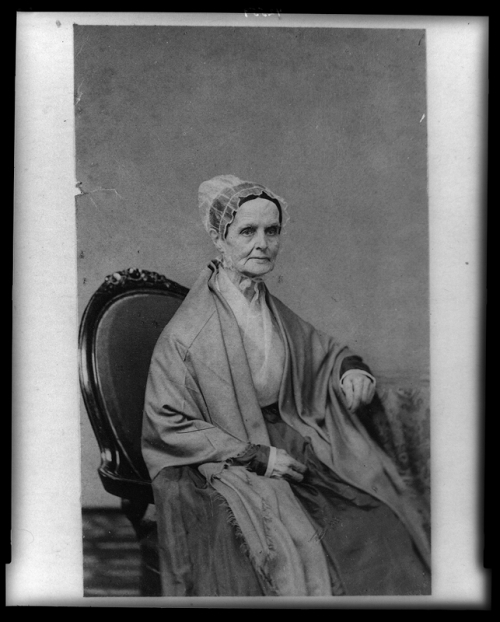 Born into a family of Quakers, Lucretia Mott became a minister of the faith in 1821. Her experience as a teacher in a Quaker school, where she received half the salary of the male instructors, led her to feminism. In the 1820s, she toured on the lecture circuit, delivering talks on a variety of progressive topics. An early abolitionist, she attended the founding convention of the American Anti-Slavery Society in 1833 and, like many other Quakers, boycotted slave-produced goods such as cane sugar and cotton cloth. Her home later became a safe house along the Underground Railroad. Turning her attention more fully to women’s rights, in 1848 she and Elizabeth Cady Stanton organized the first feminist gathering in the United States, at Seneca Falls, New York, where they issued the Declaration of Sentiments. Mott’s activism in the cause of civil and women’s rights continued until her death in 1880. Unknown artist. Lucretia (Coffin) Mott, between 1860(?) and 1880. Library of Congress, Prints and Photographs Division, Washington, D.C.